Love, care, emotions and everything which answers ‘Who we are?’ comes from the great and selfless nurture of our near and dear ones. From the grandfather who took us to the nearest children’s park in the society, grandmother’s storytelling that leads to the most amazing fairytale (better than DC and Marvel, I tell you), siblings innocent and adorable fights which doesn’t last long but it’s mandatory to have it once a day just to make our presence felt, father’s surprise gifts on our birthdays no less than a miracle and the one who knows everything we wish to have in our life – mother, her unconditional love and ineffable care completes the circle of strength known as ‘Family’. Family is the backbone of our life – past, present and future. When was the last time you flipped through a family photo album that had pictures of your ma-papa, dada-dadi, bhai & behen, dog & cat? Can’t remember that togetherness though you had infinite moments of happiness? Why? Ummmm….Ummmm. Don’t bother. What’s gone is gone; as they say let bygones be bygones. Now is still the best time to know why your roots are so strong. Know it, indefinitely. This time, tell your wonderful, amazing and crazy family stories in a unique way. 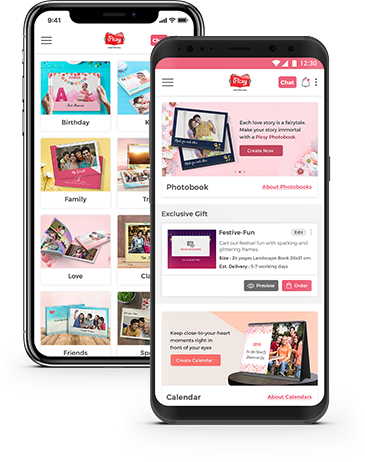 Express your infinite love differently and creatively with Family Photo Albums from Picsy. The day you flip the photo book pages will become the most memorable day of your life. Mark it, really! Picsy Family Photo Books give you the happiest tears and take you to the flashback, just like that. So, now you just don’t talk about your happy pasts; you go into it. Preserve your ‘One day, I will be like you, Papa’, ‘You are the best mom in the world’, ‘I couldn’t get a better sibling. Thanks, God’, ‘The best storyteller award goes to my grandma’, ‘I still want to hold your finger and go to the park again, grandpa’ and every ‘If I had no family, I would become an alien from Mars’ moments in a premium personalized family photo albums. Getting emotional? Don’t be sad! The sad part about happy moments is that it happens just once and the best part is that you can relive all those ‘Once in a lifetime’ memories with Picsy Family Photo Books. Note: We know every family is different. Therefore, we have different family-packed themes i.e. you can make creative and stunning family photo albums.